Home » Drone » Parrot Sequoia Vs MicaSense RedEdge Cameras, Which is Better? Parrot Sequoia Vs MicaSense RedEdge Cameras, Which is Better? 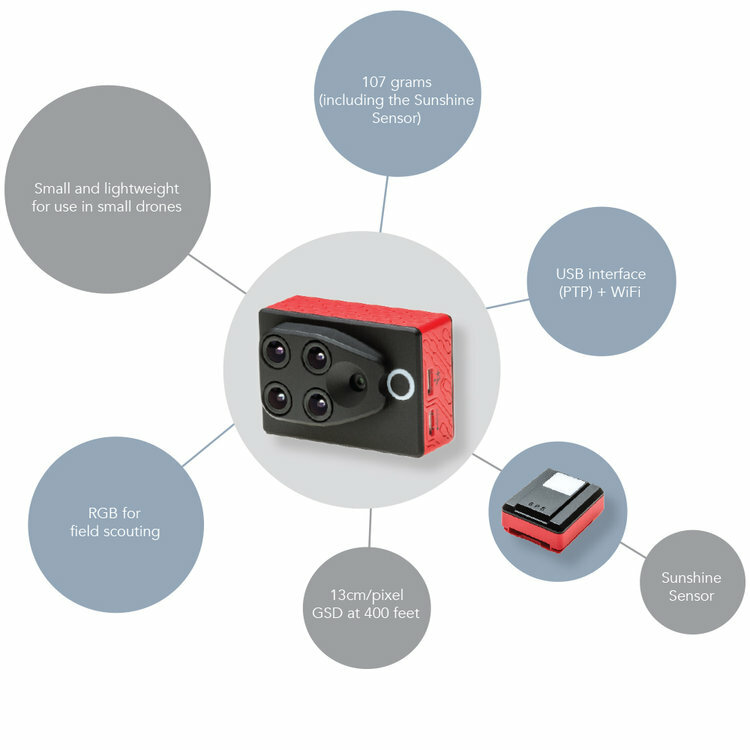 What is the difference between the parrot Sequoia camera and the MicaSense RedEdge camera and it can be a little bit confusing because they're both red, they're both narrowband multispectral cameras, and they're both used for crop health analysis, and there's a relationship between the two companies. Parrot makes the Sequoia camera and they are based out of Paris in France and they are at the investor in MicaSense which makes the RedEdge camera and they are based in Seattle Washington and so parrot makes the Sequoia, MicaSense makes the RedEdge. Now what are some of the other differences between the two cameras, well size for one, so you can see that the Sequoia is about the size of a GoPro versus the RedEdge which is a little bit bigger. The Sequoia weighs a little bit less at about 100 grams versus the RedEdge which is about 170 grams or so both of those including the light sensor and the GPS package in them. There also have different numbers of bands between Parrot Sequoia and MicaSense Rededge. Sequoia has four bands so red, green, red-egde and Near-Infrared (NIR). MicaSense RedEdge has a blue and extra blue band in there, so you have red, green, blue, red-edge and Near-Infrared (NIR) and that allows you to get an RGB composite of the different bands to create a color map, whereas in Sequoia you also have a 5th lens on there which is a 16 MP RGB camera and the camera is actually available for creating color maps, however it is on a rolling shutter compared to the four bands which are on a global center similar with the RedEdge. Both cameras produce TIF files for their single bands then you get a jpg for the RGB on the Sequoia. You can also communicate with both of them through Wi-Fi so you can use a phone or a tablet and you can log directly into the cameras to trigger them or set the triggering pattern based on time or distance if you're using the external GPS and so that's a great feature of both of these particular cameras when you're out there mapping plants. Another difference between Parrot Sequoia and MicaSense Rededge cameras is power. Sequoia consumes approx. 6 Watts of power (continuous) for both the camera and irradiance sensor. Sequoia runs off 5.0 Volts, but 2.4 Amps to trigger it reliably. It means you can't just use a standard 2 Amps or 1 Amp battery pack to plug it. You really need direct power out of the drone direct from the battery and then step it down using a BEC or use one of the integrated solutions like the Parrot Disco or Bluegrass or maybe the SenseFly eBee SQ. The new RedEdge-M however has much wider power constraints and so now you can use direct power out from say a USB or you can integrate it directly into the drone into the battery and so for most applications that you don't have to use a BEC or a power regulator to power the camera and trigger it reliably and you can look at the integration guides for both cameras to really figure out those specs. One of the other differences is price so the Sequoia runs around USD $3,500 with some academic discounts the available if you apply it so a Parrot has their own education page you can go to that page and look for the discounts. 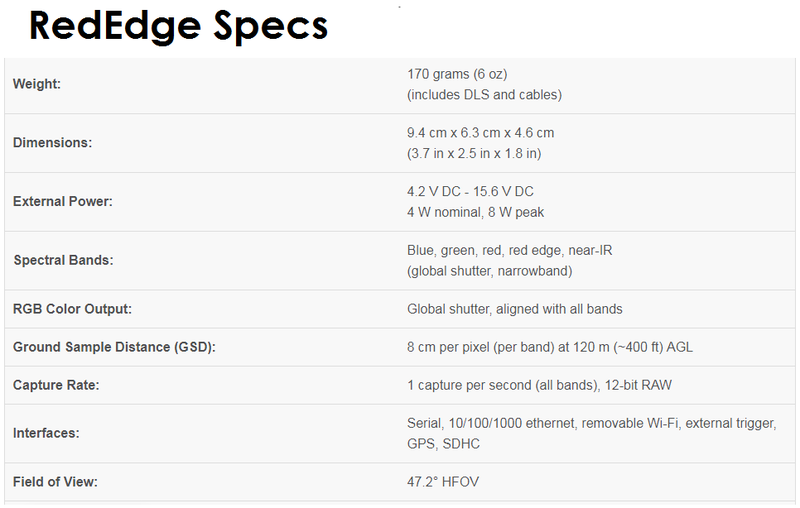 RedEdge is more like $4,900 USD a little bit more expensive and you there are some academic pricing available around a 5% discount or so if you contact micasense directly. There's a range of processing options available for both cameras, however for Sequoia you're primarily going to use Pix4D. Parrot also it was an early investor in Pix4D. Take advantage of the speed and reliability of Pix4D software for processing, and the ag-specific analytics, visualization features, and scouting tools available in MicaSense Atlas. However MicaSense recently updated and this is big news for the academic community or the R&D community is they've opened up their images so with a GitHub site so you can calibrate the imagery yourself using a Python script. What this does this GitHub site will explain it, it allows you to push the RedEdge imagery to other options, so you can use in Agisoft PhotoScan, you can push it to some other open source photogrammetry engines, you can also do single image NDVI or you can do batch processing or some custom image analysis. This might be good for using machine learning or doing plant counting down the way if you're really developing around Multispectral imagery. Now one question we get all the time is which camera do we prefer and the answer is really well it depends on your application, if you're just out there scouting we are trying to get some basic data layers, we think that Parrot Sequoia is a fine camera and it saves you a little bit of money. If you're out there and you're doing your PhD and remote sensing, if you're doing R&D for your company surrounding vegetation mapping or you're an agency or something trying to get very custom data layers, then we think that you're going to need to go for the RedEdge. So those are some examples of the differences in the similarities between the cameras Parrot makes the Sequoia, MicaSense makes the RedEdge. However they are related in terms of the same family of companies but there are slight differences between the two cameras. For summary, you can see the graphic images below. 0 Response to "Parrot Sequoia Vs MicaSense RedEdge Cameras, Which is Better?"